I am planning to make this for a chili cook off! The event is on a Sunday @noon. Would you cook the day before minus the dairy items OR cook everything the morning of? Beth, either way will be great! Do whichever is easier for you. This is my second time making it and my husband and I are HOOKED! I can’t eat hamburger meat (because of texture) and so I wanted to make a white chicken chili. My husband was a little hesitant at first, but now he insists that I make the full amount so he can have leftovers! So good!!!! Thanks so much for sharing! Wow..just wow. This lived up to the ratings and the hype. Delicious!!! I’ve never made White Chili before but wanred to try. I googled “Award winning White Chicke Chili” and found this recipe. I made this for last night, my husband started eating it and said “Honey, this will win your chili cook-off at work”. Lol! I didn’t use all of the cheese or sour cream it called for, just my my preference. I will be making it again and definitely will submit it in October for our contest at work. Thank you for the great recipe! I’m so glad you and your husband enjoyed! Keep me posted on your chili cook-off results. I hope you win! Can I put the chilli in the freezer? Maybe I can put it before adding the cheese and sour cream? How long can I keep it in the fridge when it’s all mixed? Yes, Marie, you can freeze it. I like your idea of adding the cheese and sour cream after you defrost it. 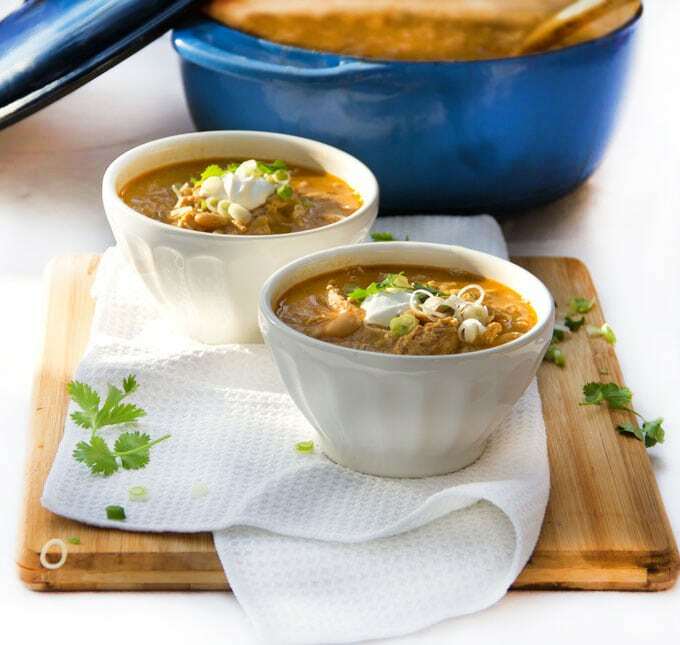 There’s always a risk of separation when reheating frozen soups that contain dairy. This way you’ll be able to add the diary when the soup is warming up and it should be perfect. Once the soup is mixed it can be kept in the fridge for up to three days. I hope you enjoy! Made this for dinner tonight & it was a huge hit! I was hesitant to add the cheese & sourcream at the end (knowing that we always use them to top our chilli)….i was pleasantly surprised with how delicious it made the chilli! I halved the recipe (because it’s just 4 of us with 2 being 6 & 3 yrs old 😉) I’m regretting not making the full recipe to throw some in the freezer! Will definitely make again in the near future. Thanks for a delicious recipe!! You are so welcome Annie! I’m glad you enjoyed. Thank you for coming back to leave a comment. I have been an avid cook all of my life and just wanted to congratulate you on a fantastic recipe! We are not spicy eaters in my family, so I left out the cayenne and went easy on the canned green chilies. Your recipe still had delicious warmth and depth of flavor. I will be making this again and again! I’m so glad you enjoyed Pamela! Made it. LOVED IT! Even the picky eaters in my family enjoyed it! Thank you for sharing! Yay! Thanks so much for coming back to let us know!! Have been searching for (and tryng!) 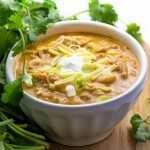 MANY white chicken chili recipes. This one is the best! My whole family loves it. I take the shortcut of just using an entire rotisserie chicken from the store (and boiling the carcass for the broth), and it’s still fantastic. Thank you! I feel like my long search for an amazing white chili is finally over! I have never comment on sites before. But I found this recipe from Pinterest, and I decided to make it for my company’s chicken cookoff. I followed the recipe to the tee. Happy to share that I took home 1st place among 12 competitors. Folks raved about this chilli and demanded the recipe. So thank you very much for sharing this wonderful recipe. Congratulations on your win! That is so exciting! I’m really glad you decided to leave a comment – I love hearing that a recipe turned out great – makes my day. Just made this last night—it was fantastic! Thank you! Thanks such great news! Thanks for circling back!! I made this for a Chili Cook off last night and won 1st place in “Fan Favoritte”!! The only addition was 2 poblano peppers and a jalapeño. It was absolutely delicious! Thank you heaps for sharing this recipe and helping me bring home the trophy!! I made this recipe last night. I cooked it ahead of time (minus the cheese and sour cream) and left it to warm in the crock pot while we were at practice, and then I added the remainder of the ingredients when we got home. It was amazing! I just made this for my family and they LOVE it. I changed it a little. I used half the chicken and added a can of sweet corn. It is so yummy!! Thank you! Very excited to try this recipe out for Christmas this year! Do you have a recommendation for making this in the crockpot? The chicken will be cooked beforehand either way, but how long should I leave it to cook in the crockpot for it to be best? I haven’t tried making this in a crockpot but I my guess is that it will work well, as long as you keep it on the low setting so it never comes to a boil. Here’s a great article on how to convert a recipe to the slow cooker: https://www.thekitchn.com/5-tips-for-converting-recipes-to-the-slow-cooker-189343 I hope you have a great holiday and a delicious Christmas dinner! I just made this and literally just took the last bite of my bowl and had to comment on how amazing this chili is!!!! I’ve always enjoyed a traditional white chili but this completely knocked our socks off. The whole fam enjoyed it and it soothed some sore throats today. The only change I made was I used only 2 cups of cheese and 1 cup of sour cream and I added 4 lbs of chicken. It’s definitely not as creamy as your pictures but I still think it had so much flavor. So so SO good! Thanks for making my day with your comment Lauren. I hope all the sore throats are feeling better! Wow this recipe is amazing! Thank though for sharing. I made with 2% and red onion due to ingredients on hand. The chicken flavor was amazing. A little pink when I removed from oven but knew the simmer would cook it through. Used extra oil from chicken to fry onions and garlic. Thanks so much for coming back to let us know how it turned out. I’m so glad to hear that you enjoyed!! Recipe looks awesome. Would love to make for my family Christmas this year. If I make it a day or two ahead of time, does it heat back up well in a crockpot? With all the dairy it it, I’m concerned it may separate by refrigerant and reheating. Would you recommend following the recipe until the addition of dairy and then on the day it will be eaten, do that last step? Any suggestions? Thank you. I know my family will love it! Hey Nikki, good question. I like your idea of adding the dairy on the day you’re serving the chili. You’ll have much more control that way and minimize the risk of the dairy separating. Heat it slowly and gently when adding the dairy, stirring often, and don’t let it bubble or boil, and it should be perfect! I hope you and your family have a fun and delicious holiday! Your receipe says it mahes 10 servings. Ehat are your serving sizes. (1) cup or (1 1/2) cups? The servings are generous – 1 1/2 cup servings or even a bit more. I won a chili cookoff with this recipe yesterday. The only change I made was to add 2 roasted Poblano peppers and two chopped jalapeños. Thank you for the recipe! It definitely is a winner! I followed this recipe to the T a month or so ago and my whole family loved it. We mixed all of the dairy ingredients into the chili just to see how it turned out and it was bomb.com. Today we decided to swap out the sour cream and use coconut milk and pumpkin to thicken. We still used some of the cheese but wanted to cut down on the dairy. It turned out nice. This recipe will forever be in our family lineup. Thanks for sharing! Big hit with a family of four and even the most picky eater admitted that he liked it. My 10 yr old daughter wanted to enter-and win the chili cook off at our church’s Harvest Festival. Your directions were so thorough, she was able to follow them easily (after reading through a few times). We only used 1/2 an onion. The flavors are wonderful! We should have made it a day ahead since the flavors really settled and were more robust day 2. 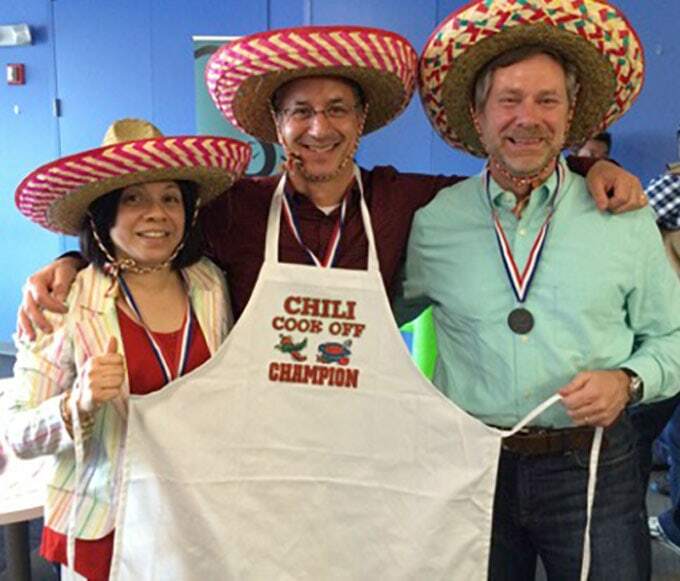 And, she won the coveted chili cook off trophy! Thanks for such an awesome recipe! Wow, congratulations to your daughter on her big win! And I’m glad to know that you and your daughter found the directions thorough and easy to follow – thank you so much for your feedback! I made this last night and it’s amazing. I know roasting the chicken is part of the process, but I was in a hurry and used a rotisserie chicken. It was still delicious. I just made this tonight for a chili cook off at church tomorrow! So excited! I am putting it in the fridge overnight and reheating tomorrow on low heat. I hope that doesn’t take away from this chili. Is that what you would do? Make it the night before and put it in the fridge? This truly is an award winning chili! I just took second place in my company’s chili cook-off with a variation of this recipe. I missed out on first place by 1 vote. Thank you very much! Well it a cool, gloomy enough day Oct 5 2018 in chicago. So I thought I needed a pot on the stove. So I made this FABULOUS recipe. Hello Lisa I found you just today I was looking for a good chicken chili and yours is great, I am a blogger and a retired chef,I have made so many chili recipes, but really never a chicken chili, so when my brother asked me for some ideas, I googled for chicken chili and got yours, in fact I will make some for myself later, I did give my brother your recipe I just gave him a few ideas, I would like to post your recipe on my blog ,and link it back to you, so my viewers can get the recipes I would never take credit. with your permission of course. you have a great looking site and i see many dishes, from middle east? very interesting. Thank you for the recipe and your great blog. Hi Ernest, Great that you found this recipe and Panning The Globe! Thanks for your kind words about my site. I’ll check out your blog too. With regards to reposting my recipe, all photos and content are copyright protected so please do not use our photos without prior written permission. 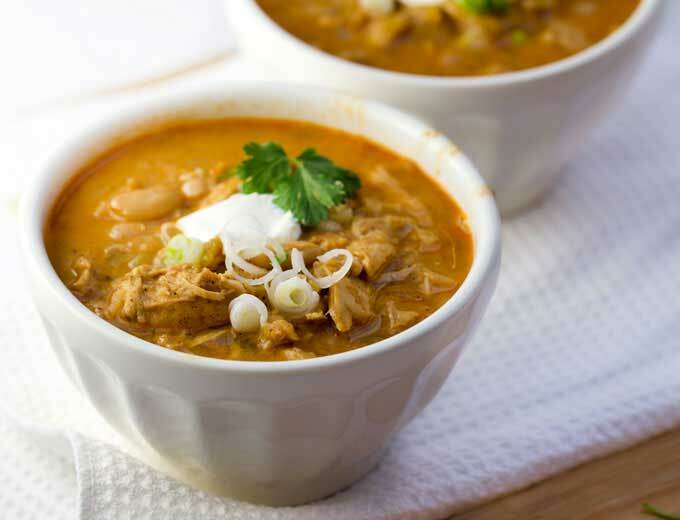 If you wish to republish this recipe, please rewrite the recipe in your own unique words and link back to Award Winning White Chicken Chili on Panning The Globe. Thank you! Hi! Ever use thighs instead of breasts for this? I’ve never tried this with thighs. It’s so good with chicken breasts that I haven’t felt the need to experiment further. But thighs are so flavorful – I’m guessing they’d be great! Brilliant. Just what I needed and it was a hit! Great receipe…just made it for a small gathering…it definitely has a bite to it…but not out of hand…I added another can of beans to mine …and went ahead with the cheese and sour cream…it really gave it that extra bar. I like mine with a dash of lime along with a savory red pepper cornbread.